Controls can be positioned and sized either in terms of screen percent or pixels. 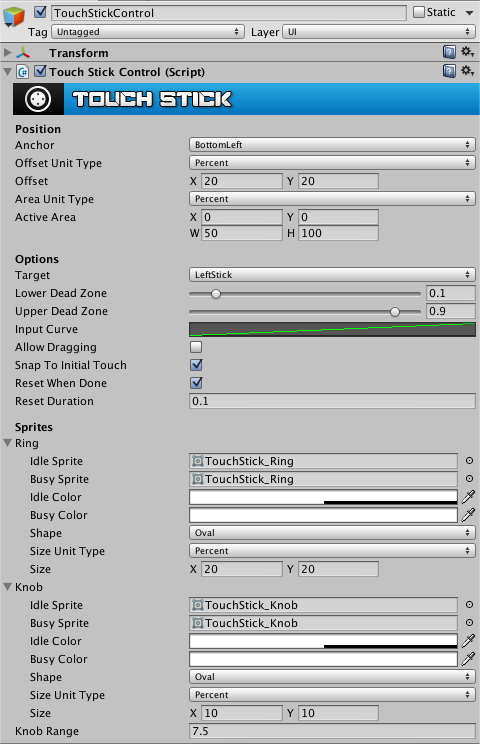 Create a new game object in the scene hierarchy named InControl. Attach the InControlManager component to the InControl game object. 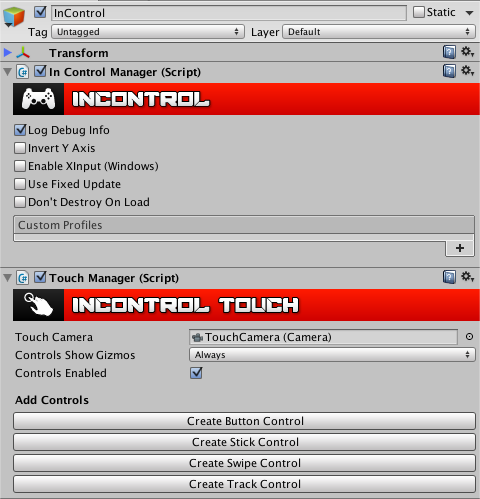 Add the Touch Manager component to the InControl game object. Create a Touch Camera game object as a child to the InControl game object. At this point InControl is set up for touch support. Even without adding touch controls, you can now take advantage of the TouchManager API to query touches, which provides a few advantages over Unity&rsquo;s touch API. 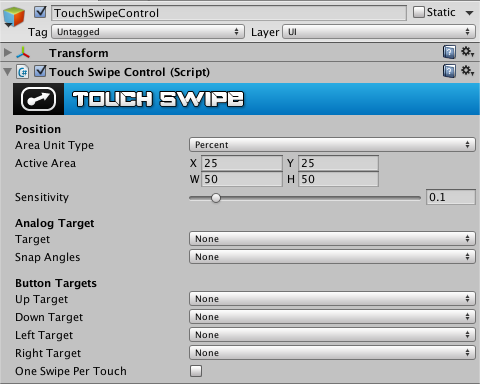 Touches in InControl are represented by classes instead of by structs like Unity&rsquo;s touches. This means you can grab a reference to a touch and hang on to it. You can also compare touches for equality using these references. The primary advantage is tracking touches is far easier. InControl also ensures touches are properly cancelled when they should be. Unity does not always take care of this. The TouchManager component is also a singleton class with a static public API, making it convenient to use and query elsewhere in your project. These correspond to the equivalent members of Unity&rsquo;s Touch struct, and add a few more. You can use the TouchManager.ControlsEnabled property to enable and disable all touch controls as a whole. When controls are disabled, they will be hidden and will not provide any input events. Additionally, touch controls can be enabled or disabled individually by setting the enabled property of each control component. Touch controls may be enabled and disabled at run time. You can add a button touch control to the scene via the GameObject > InControl > Touch > Button Control menu command, or with the &ldquo;Create Button Control&rdquo; shortcut button on the TouchManager component. You can add a button touch control to the scene via the GameObject > InControl > Touch > Stick Control menu command, or with the &ldquo;Create Stick Control&rdquo; shortcut button on the TouchManager component. You can add a swipe touch control to the scene via the GameObject > InControl > Touch > Swipe Control menu command, or with the &ldquo;Create Swipe Control&rdquo; shortcut button on the TouchManager component. 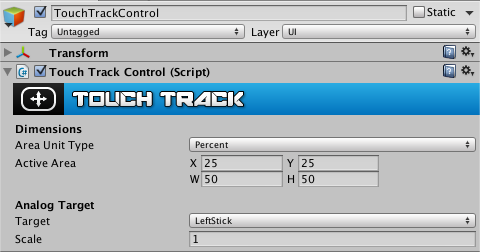 You can add a track pad touch control to the scene via the GameObject > InControl > Touch > Track Control menu command, or with the &ldquo;Create Track Control&rdquo; shortcut button on the TouchManager component. All properties of touch control components can be modified at runtime, including their sprites, sizes and positioning, whether to use percent or pixel units. Copyright © 2019 Gallant Games, LLC. All Rights Reserved.